Fetish pour Homme (Parfum) is a popular perfume by Roja Parfums for men and was released in 2012. The scent is leathery-spicy. Projection and longevity are above-average. It is still in production. If I remember correctly, then this experience was too intrusive for me - too intrusive, because it only smelled, but certainly did not smell, I was happy when it was gone. I washed up and got something on it. Because of poor quality. What do I want from a scent? One is immediately suspicious, if man/woman does not only silently reject highest price offers, but complains insulted. Not about the price, nor about the equivalent value, but about the worthlessness! Yes, there is some "in there", pretty much everything listed exactly as in the above "pyramid". And it also develops this way according to head/heart/footnote. But what I can't list here is the continuous impression of any mixture, a juxtaposition of supposedly important because expensive, noble tand, a mishmash. The Eau de Toilette serves all the buttons a regular perfume buyer wants pressed. And yet, just at this price, it is expected and compared, whether the bid would be this late. Yes and no. It's all "in", but nothing comes of it. It is too dense, opaque for that - as already written, it does not smell, but smells. So there is no space, no not already occupied qmm on the olfactory mucosa besides the notes/chords, on which a new unusual impression could develop. The beauty of the unexpected is missing. It may be expensive, but it is also lacking in fun and art, unimaginative, usually like a bath cleaner. Probably more so than different. Roja stands for quality. Roja stands for exclusivity. Also for beautiful flacons. And also for less attractive price tags. And Fetish serves each one of these points from A-Z. After Reckless, my first Roja, I was curious about the exclusive fragrances this brand still has in stock and tried fetish. And I immediately succumbed to this temptation. The fresh start is deceptive about what the wearer of the fragrance will expect over the next few hours. Already the colouring of the water (a clear trace darker than Reckless) indicates that it will go here again completely differently to the thing. If lemon and lime are "flown away" (in quotation marks, because with Roja something never flies, but only steps discreetly into the background) the heart note begins to fade with a lot of Neroli impression. I could not hear the violets listed in the fragrance pyramid. And while you're half surprised, half happy about the change from the head to the heart note, a scent thunderstorm comes from behind that will stick to its wearer for the next few hours and catapult him into a league that few perfumes I've owned or tested so far have ever been able to match. The thunderstorm slowly but surely begins to establish the fantastic base note on its wearer, essentially prominent here pepper, leather, musk and subtly a hint of vanilla. Dark storm clouds pour down on you with this composition, the individual components rain down on you and sometimes more, sometimes less come to the fore. The leather cloud remains above you, lightning brightens the dark horizon and gives you a masculine aura that for some might indeed be too much of a masculinity. For hours, the thunderstorm takes possession of you and makes no move. When you fall into bed tired, you wonder about the steadfastness and even the next morning the first thing you notice is the fetish of the storm of scent. Sillage and durability as to be expected from Roja, on top notch level. The bottle is simply beautiful. And the fragrance itself is a handcrafted, superbly crafted unicum in the segment of spicy leather fragrances. Reckless is from my point of view more portable and already a statement per se. Fetish is the increase in all respects. 100% male. Uncompromising. An exclamation point for the environment. Everyone within three meters will see you, whether you like it or not. And everyone notices that something special, something special, something expensive is coming. With fetish you stand out. A scent for doers, for winners, for alpha animals. For all those who always get up when they've fallen down. For real guys who run their heads against the wall until the plaster starts to crumble. Simply for men with a pronounced fetish, no matter for what. Fetish pour Homme (Parfum) opens with a dash of brief bergamot and lime slightly tart citrus before quickly transitioning to its heart. As the composition enters its early heart an emerging cardamom spiced slightly smoky, woody incense-like accord takes command with hints of ginger joining the remaining lime citrus in support. As the composition slowly moves further into its heart, the woody incense gradually recedes as vetiver spiked leather slowly takes over as star. During the late dry-down the vetiver spiked leather remains, now joined by slightly powdery vanilla and oakmoss in the base through the finish. Projection is excellent and longevity outstanding at over 15 hours on skin. Fetish pour Homme (Parfum) is frequently compared by many to Puredistance M. The vetiver and leather found in the late heart section certainly does have some major similarities to M, coupled with the two additionally sharing a similar spicy structure. That said, those calling Fetish pour Homme (Parfum) pretty much the same composition as M do both a disservice. The key difference (though far from the only one) is Fetish pour Homme (Parfum) features a very strong woody radiant incense-like accord that really is the focal part of the composition for a good portion of its development. So strong was the woody incense in the heart that I really would classify Fetish pour Homme (Parfum) more as a woody composition than the leather most focus on. While M is a more pure spiced vetiver leather play, Fetish pour Homme (Parfum) has a lot more going on as it transitions from citrus to woods to leather to slightly powdery vanilla with each transition seamless. As with the other Roja Dove compositions I have sampled so far, ingredient quality is superb. Also, just like the other Roja Dove compositions the selling price is anything *but* superb. That said, in the case of Fetish pour Homme (Parfum) the quality of the materials and the outstanding end result of the perfumer's skilled execution makes me want to forget about the relatively high cost per bottle and just "bite the bullet" and acquire some of this stuff because it gets pretty addictive, fast. The bottom line is the $480 per 50ml bottle Fetish pour Homme (Parfum) is much more than a duplicate of the great Puredistance M, both proving near equally worthy of owning, earning it an "outstanding" 4 to 4.5 stars out of 5 and a strong buy recommendation if one can afford its admittedly lofty price. Once again I am under the spell of Roja Doves' gorgeous perfume collection. I am captivated, bewitched, enslaved by the glorious splendour each of his fragrances exude. 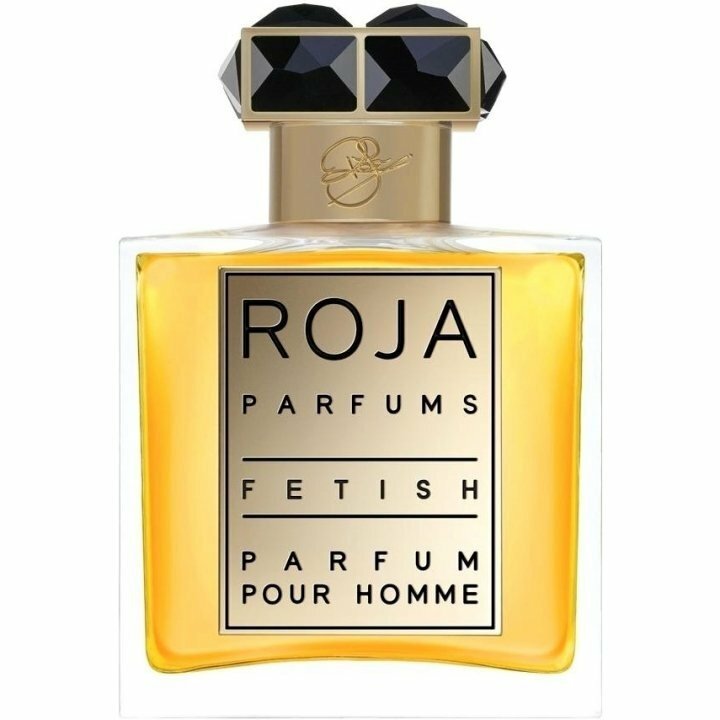 Until now I had the chance to try the following Roja Parfums: Amber Aoud, Aoud, Scandal pour Homme and now Fetish pour Homme. Some years ago I tried Diaghilev and Unspoken, but I can't remember how they smell anymore, what a pity! It was a time where I had so many samples that I could not pay attention to one fragrance for more than 2 seconds, so I also forgot about these two treasures. But I will definitely refresh my memory some day. My absolute favorite so far remains Amber Aoud. Never before did a perfume cast it's magic upon me this strongly. Never before did I fall in love with a smell like I did with Amber Aoud. Trying Aoud was also a magnificent experience, even though I prefer Amber Aoud just a little bit more. Today, my journey through the collection of the worlds sole "Professeur de Parfum" continues. Fetish pour Homme, a fragrance for men with a distinct leather note. For me, there are two kinds of leather perfume: The "soft leather"; including fragrances like Guerlain Cuir Beluga and Tom Ford Tuscan Leather. And there is the "bitter leather". Robert Piguet Bandit and Montale Aoud Cuir d'Arabie are but two of many examples how bitter leathers smell. Fetish pour Homme is supposed to be a bitter leather, and usually these kind of leathers are not for me, I prefer the soft ones. But thanks to my fragrance journey I learned, that sometimes there are fragrances that don't belong to ones favorite olfactory family, but they appeal to you nonetheless. So what about Fetish pour Homme? Just a single drop is enough to endulge in the rich aroma of Fetish pour Homme. At first, the scent shows a lot of character, is spicy and intense, almost dusty. A hint of citrus can be found in the first few minutes, hiding in the background. This scent is voluptuous and wicked, in a most beautiful way. Parts of the base notes are present from the fist moment on: Cinnamon, Pepper and Leather are the notes that stand out the most in the scents first 15 minutes. If you want to try Fetish pour Homme, be prepared for it's highly potent and opulent nature, or else you might be unable to cope with the sheer abundance of facets. At first, I was a bit sceptical. The scent seemed to be much to harsh, spicy and rich. Luckily, this was just my first impression. I know that Roja Doves creations often need time to reveal all their beauty and liveliness to the wearer. Often his scents change dramatically after just a few minutes. Lo and behold: It is true: Fetish pour Homme is one of those perfumes, that change over time. After 30 minutes on my skin, the scent becomes softer. The floral heart takes some of the sharp edges out of the fragrance, the scent becomes like a second skin. The warm, leathery and amber like aroma is enriched by a subtle powdery note, could this be the violet? Without letting the scent actually smell floral, it gives the whole composition a beautiful mildness. The fragrances striking character is luckily not lost during the tranformation, Fetish pour Homme stays powerful and distinctiv. All of the Roja Perfumes I tried, stayed beautiful even in the later stages of development. More and more of todays perfumes start to fall apart after the head note is gone. They fade away, like a withering flower, becoming unrecognizable. The reason behind this is, that many modern perfumes are composed to impress customers with just their initial notes, trying to seduce the customer into quickly buying them. The heart- and basenotes do not matter, as there seems to be no time for them in modern perfume stores. Not only designer fragrances are the ones to blame, but also countless creations from the niche market. I do not talk about linear creations, which are fine, but only about those who fade too quick. Roja Doves perfumes, however, are not like that. Fetish pour Homme showcases how magnificent even the basenotes can be: Intense and lasting, complex and deep. All the facets from before are still here, but are now embraced by a soft whisper of Vanilla and Patchouli. Warm, attractive, sensual. These attributes are perfect to describe the fragrance. A subtle Chypre accord is crowning Fetish pour Homme, it is probably rooted in the oakmoss listed in the notes pyramid. Just like Scandal pour Homme, Fetish pour Homme is an excellent fragrance. Even though I usually dislike leather fragrances like this, there is something about this one I just adore. Every perfume lover who prefers fragrances with a wild and intense nature, will be thrilled when smelling Fetish pour Homme. Roja Dove created a cinnamon-spicy leather Chypre beyond compare, and I can't get enough of it! I surely am in loe with Rojas fragrances, I want to thank him for creating these modern classics! There are so much more Roja Parfum fragrances I need to try, and yet they are pretty hard to get their hands on. The ones I want to try the most are Amber, Enigma pour Homme, Nüwa, Diaghilev and Musk Aoud. But, to be honest: I want to try them all! This collection is refreshingly different, and my passion for these creations if just beginning! The smoke is more dense than in case of EdP. But both versions have one thing in common: hardly sprayed, the first negative feedback comes.